It sounds too good to be true; two species helping each other survive for millions of years – each getting as much as they give. Soapweed yucca (Yucca glauca) is a common plant in the Great Plains but also occurs in dry sandy and loess soils in Iowa, Missouri, and Arkansas. 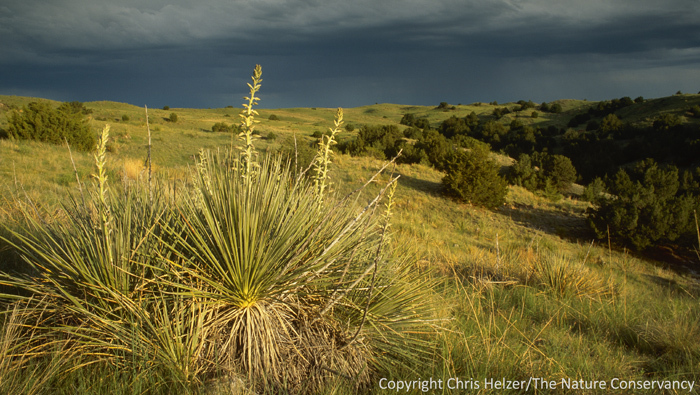 For more than 40 million years there has been a relationship between yucca plants and yucca moths. It’s a particularly important one because neither the yucca or the moth can survive without the other. The moth’s larvae depend on the seeds of the yucca plant for food, and the yucca plant can only be pollinated by the yucca moth. The yucca moth (Tegeticulla yuccasella) on soapweed yucca at The Nature Conservancy's Niobrara Valley Preserve in north-central Nebraska. 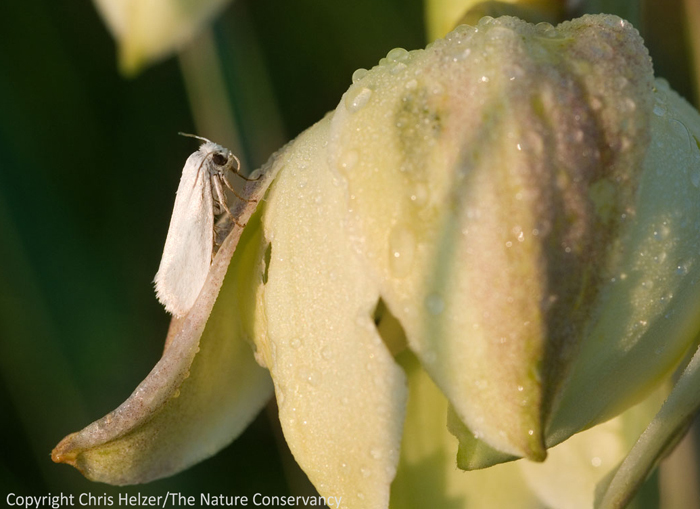 In the central United States, soapweed yucca (Yucca glauca)- is pollinated by a moth known as Tegeticulla yuccasella. Each spring, adult moths emerge from underground cocoons and the males and females meet up with each other on yucca plants to mate. 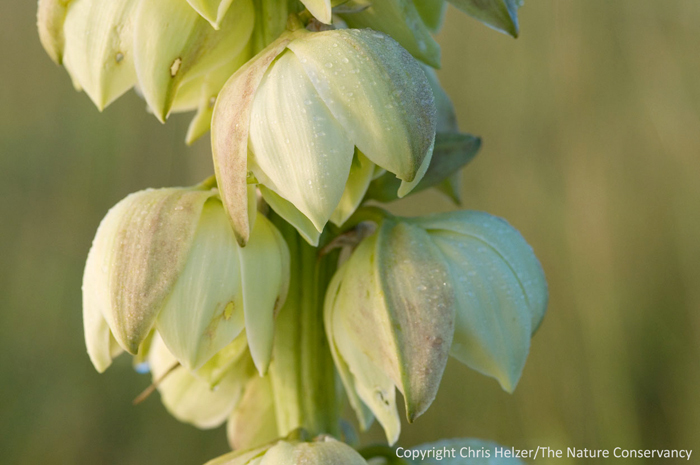 When a female is ready to lay eggs, she first goes to a yucca flower to collect pollen. Unlike most moth species, yucca moths have two short tentacles near their mouth that they use to scrape pollen from the anthers of the flower. As she collects the sticky pollen, the yucca moth packs it into a ball and sticks it under her head. She then flies off to another yucca flower. When she arrives at the second yucca flower, usually one that has very recently opened, she goes straight to the bottom to find the ovary. She opens a small hole in the ovary and lays her eggs inside. Once the eggs are laid, she scrapes a small amount of pollen from her sticky ball with her tentacles, walks to the stigma of the flower, and packs the pollen into tiny depressions within the style. She may then return to the ovary of the same flower to lay more eggs or fly to another flower. Either way, before she leaves the flower, she marks it with a pheromone (a chemical other moths can sense). The scent marker will tell later visitors that they’re not the first to reach the flower, and they will either lay fewer eggs than the first moth, or none at all, depending upon how many moths have left their scent already. This helps moderate the number of larva that hatch within each flower, and prevents the plant from aborting the flower altogether, which it will do if too many eggs are laid. When the eggs hatch, the larvae feed on yucca seeds within the fruit. Typically, there are more seeds than the larvae in a particular flower can eat (since the plant aborts flowers that are too heavily laden with eggs). When the larvae finish eating, they burrow out of the fruit – usually during rain events, interestingly – and burrow down into the ground to make their cocoon and wait until the next spring when the whole process plays out again. As far as anyone knows, and it’s been studied since the 1870’s, no other species besides the moth pollinates yucca flowers. Similarly, yucca moth larvae don’t feed on anything other than yucca seeds. So each species depends upon each other for survival, and both benefit from the relationship. If you’re interested in a much more detailed review of yucca moths, you might like this article by Olle Pellmyr. If you want to read about some additional interelationships with yucca, the moth, and other insects, you might be interested in this article by Laura Hebert. – thank you to Mary Ann Feist for help with this post. This entry was posted in Prairie Insects, Prairie Natural History, Prairie Photography, Prairie Plants, Uncategorized and tagged grassland, insect, macro photography, nature photography, prairie, yucca, yucca moth by Chris Helzer. Bookmark the permalink. I visited your blog because of Ted MacRae’s recommendation. Great site! Would you be willing to submit your post, The Yucca and the Moth, to the upcoming blog carnival of plants, Berry Go Round #38? I think it would be a nice part of that round-up of great plant posts. Sorry – that will be Berry Go Round #35, scheduled for late December. Thank you! Thanks for introducing me to Berry Go Round! I just emailed the URL to the submission email address. Excellent. What an elegant relationship – thanks for sharing Chris, great photos. wow im only 12 and i found that very amazing. Fascinating. What came first? The yucca or the yucca moth! Hi Chris, I live in Hammond IN. Great article. Can the Yucca survive here and would it attract the moth to it? Jackie – Good question. I’m pretty sure there is a yucca species native to Indiana, but I’m not 100%. I’ve reached out to a friend there and will let you know what I find out. If you’re thinking of something for your yard/garden, I think you’d want to use the native species so that the host moth species would have chance of finding it (it’d be in the “neighborhood” already). Otherwise, pollination might be unlikely. On the other hand, if you just want something pretty, the yucca would still flower without the moth, it just wouldn’t make seed. Go to US FORESTY SITE, they say neither can live without the other. Fascinating!! I recently had to write a haiku with “yucca” leaves as the prompt and this post has taught me so much…how nature works is fascinating! Thank you. I live in the national joshua forest and i have many yucca on my property. I had no idea anout the yucca moth in relation to the yucca. It is most amazing. I love the hugh desert and the many creatures who share their lives, their homes with me. I am one of the very few who didn’t alter the natural riparian habits of the desert. So many from cities move here and try making this habitat like the ones they left behind and have no idea how many creatures they are destroying or eraticating by their own selfish and ignorant behaviors. I’m just glad there are species that can and do c i continue the process of keeping live cycles going to enjoy what those relationships bring to those like myself who just enjoy being. Thank you Yucca Moth for keeping your species and the yucca alive…. We have these Midwestern yucca in our flower beds in southwestern Wisconsin. They have been blooming & forming seeds for several years. The original plant came from someone who dug it out of her own garden, so the moth larvae/pupae must’ve come along in the soil & root ball. I’d noticed the moths on the yucca and assumed they were specialists but had no clue they were responsible for the reproductive success of these grand plants. Thanks for your wonderful explanation, and for he link to Olle Pellmyr’s paper.